We report herein the first results of a CO2 efflux survey carried out at Katanuma volcanic lake, Japan. A total of 110 CO2 efflux measurements were undertaken at the lake by means of the floating accumulation chamber method during August 2010 to estimate the total CO2 output from the studied area. Two different mechanisms of degassing were observed during the survey; (1) diffusion through the water-air interface and (2) bubbling. CO2 efflux values ranged from 0.5 up to 322 g m−2 d−1. In addition, the probability graph was used to distinguish the existence of different geochemical populations in the measured values. Sequential Gaussian Simulation was used to construct a map of CO2 efflux from 200 simulations and to compute the total CO2 diffuse emission at the studied area, i.e., 17 ± 0.6td−1. During the last two decades, studies of the spatial distribution of soil CO2 efflux has become an ideal geochemical tool for monitoring volcanic activity (Hernandez et al., 2001a, b, 2006; Granieri et al., 2006; Perez et al., 2011). Several authors have demonstrated that continuous monitoring of CO2 efflux provides important information for volcanic surveillance and seismotectonic monitoring (Salazar et al., 2002; Carapezza et al., 2004; Pérez et al., 2006). Other studies have shown that diffuse CO2 emissions from active volcanoes are of the same order of magnitude as the CO2 released by visible emanations (plumes, fumaroles, etc), pointing out the importance of estimating the total diffuse CO2 output from volcanic areas (Baubron et al., 1990; Allard et al., 1991; Hernandez et al., 1998, 2001a; Salazar et al., 2001). Since the rate of diffuse CO2 emission can increase greatly before the occurrence of a volcanic eruption (Hernandez et al., 2001a; Carapezza et al., 2004), it is very important to map surface CO2 efflux anomalies and to estimate the total output of this gas regularly in order to have a better understanding of on-going volcanic processes (Salazar et al., 2001). During the last years, several studies have focused on CO2 emission from volcanic lakes. Volcanic lakes are generally formed by one of three mechanisms: 1) explosive excavation (crater lakes), 2) collapse of volcanic edifices (caldera lakes), and 3) blockage of common waterways (rivers, streams) by mudflows, lava flows or ash (http://www.wesleyan.edu/ees/JCV/vloverview.html). After the gas disasters at lakes Monoun (1984) and Nyos (1986), both in Cameroon (Sigurdsson et al., 1987; Sigvaldason, 1989), accumulation of CO2 in these lakes has been well known by the scientific community. This led to the recognition that volcanic lakes are hazardous (Le Guern and Sigvaldason, 1989, 1990; Evans et al., 1994; Kling et al., 2005; Kusakabe et al., 2008). Since a large amount of magmatic gases is dissolved in water, CO2 degassing from volcanic lakes should be a process to be taken into account (Pérez et al., 2011). Degassing through the lake surface occurs by bubbles (convective/advective degassing) or by diffusion through the water/air interface (Mazot and Taran, 2009). In order to measure the gas flux from crater lakes, it may be the only way to measure fluxes at the lake surface. This work presents the first results of a CO2 efflux measurement carried out in August 2010 at Katanuma lake, Japan. The main goals of this work are: 1) to study the spatial distribution of diffuse CO2 degassing from this volcanic lake; 2) to discriminate diffusive degassing from degassing by bubbling); 3) to estimate the total output of CO2 emitted to the atmosphere from the study area. The lake Katanuma, located in northwestern Miyagi prefecture, Japan (38°44′N, 140°43′E; 306 m above sea level) belongs to the Narugo volcanic system (Fig. 1), which is one of the 44 Holocene volcanoes in the northeastern Japan arc. According to Sakaguchi and Yamada (1988) and Soda and Yagi (1991), the activity of the Narugo volcano began with pyroclastic activity; the Nizaka pyroclastic flow (73 ka) and the Yanagizawa pyroclastic flow (45 ka). A large caldera, of about 5 km in diameter was formed by these paroxysmal eruptions. Lake deposits found in the caldera indicate that water filled the caldera after 45 ka. Afterwards, lava flows and lava domes were formed in the inner part of the caldera. 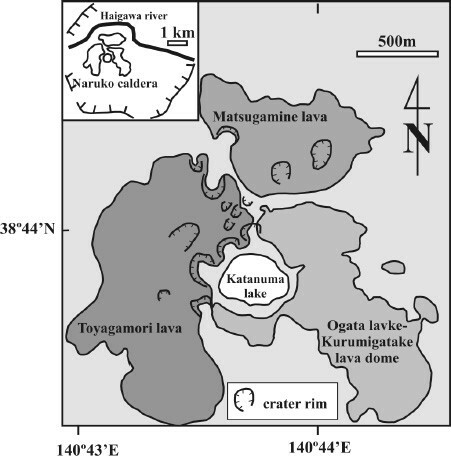 The youngest lavas, Toyagamori, have been 14C dated to be 11830±555 years BP (Omoto, 1993) (Fig. 2). Observed craters were formed in the lava surface by phreatic eruptions. The only known historical eruption at Narugo occurred in 837 AD. Location map of Naruko volcano in Tohoku area, Japan (modified from Ban et al., 2005). Simplified geological sketch map of Naruko volcano, Japan (modified from Ban et al., 2005). Grey colors indicate different lava units. Katanuma is a crater lake with strong acid water (pH: 2.0–2.2) influenced by the volcanic fluids. The lake forms an ellipse of 462 m E-W length and 326 m N-S breadth, with a 1380 m of shore line it has neither inflowing nor outflowing streams. The surface area is 1.26 × 105 m2 with a maximum depth of 21.3 m with an approximately volume of 7.48 × 105 m3. In the bottom of the lake there are some high temperature zones where hot springs flow out (Sato, 1995). These zones are located at the south and northeast basins of the lake’s deepest area (Fig. 3). Volcanic gases emanating at the bottom and along the shore line of the lake dissolve in the shallow part and acidify the water by redox reactions of H2SO3, with heat supplied at the same time at arateof372 × 10−6 cal cm−2 s−1 (Sato, 1995). Bathymetric map of Katanuma lake, Japan (modified from Takagi et al., 2005). Dashed lines indicate areas of strong bubbling gas activity. Lake Katanuma is dimictic and covered by ice from January to mid-March. Inverse stratification occurs under the ice cover. After turnover in March, weak stratification develops with a thermocline at a depth of 3–5 m. Stratification is generally observed from April to late August. The circulation period is from late August to December (Takagi et al., 2005). The CO2 efflux survey was performed during August 2010 under stable weather conditions (no wind and sunny). 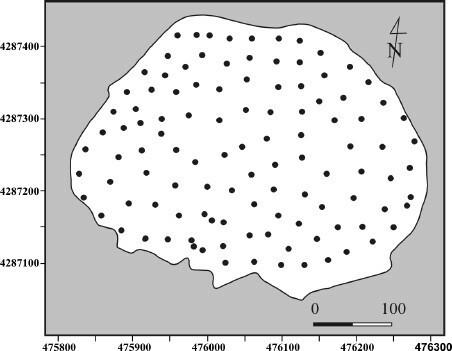 110 sampling sites were selected at the surface of Katanuma lake to obtain an even distribution of the sampling points over the area of 0.14 m2 (Fig. 4). The GPS positioning of each measurement point was recorded with a resolution ±5 m. The accumulation chamber method (Parkinson, 1981; Chiodini et al., 1998) was modified in order to work on a lake by using a floating chamber (Fig. 5). Measurements of CO2 were performed in-situ by means of a portable non dispersive infrared (NDIR) CO2 analyzer (LICOR-800 system). The LICOR analyzer was interfaced to a hand size computer that runs data acquisition software. At each sampling site, water temperature, conductivity and pH were measured at a depth of 40 cm bellow the surface by means of a thermocouple and a portable pH meter. The pH meter was calibrated on site before the start of the survey. Measurement sites during the study at Katanuma lake, August 2010. Picture showing the modified accumulation chamber for CO2 efflux measurement at the Katanuma lake, Japan. 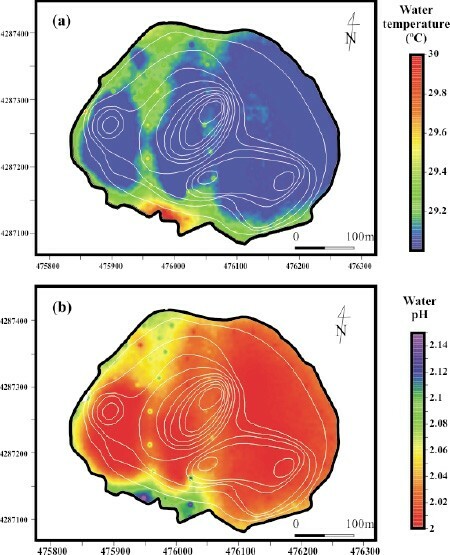 Surface CO2 efflux, water temperature and water pH maps for Katanuma lake were constructed using Conditional sequential Gaussian simulations (sGs) provided by the sgsim program (Deutsch and Journel, 1998; Cardellini et al., 2003). In order to characterize the chemical and isotopic composition of the bubbling gas from Katanuma lake, gas samples were collected and gas composition was analyzed later in the laboratory. Gas composition was analyzed by combining a Varian CP-3800 gas chromatograph with Ar as the carrier gas and a Quadrupole Mass Spectrometer (QMS) model Pfeiffer Omnistar 422. The 13C/12C ratio of CO2 (expressed as δ13C-CO2 ‰ vs. V-PDB) was determined with a Thermo-Finnigan MAT 253 mass spectrometer at the ITER laboratory. The analytical error for δ13C values is ±0.1‰. Elemental abundances of He and Ne, and He isotope composition of the gas samples collected in a 50 cm3 lead glass bottle with high vacuum stopcocks were analyzed in the laboratory of the Geochemical Research Center, The University of Tokyo. A magnetic-sector mass spectrometer VG 5400 was used for the analysis following the methodology described by Sumino et al. (2001). CO2 efflux values ranged between bellow the detection limit of 0.5 and 322 g m−2 d−1. Water temperature and pH ranged from 28.1 to 30.6 and 2.00 to 2.19, respectively. Figure 6(a) shows the histogram of log CO2 efflux values (in g m−2 d−1) versus their frequency. The distribution of CO2 efflux differs from a log-normal distribution indicating that there are at least two different mechanisms of degassing through the lake surface. Following the methodology described by Sinclair (1974), a Log-normal probability graph was constructed with the CO2 efflux data (cumulative percentile frequencies against class intervals) to distinguish the presence of overlapped Log-normal geochemical populations that are recognizable by the inflection point on the curve (Fig. 6(b)). The inflection point of the curve allows us to distinguish the threshold value between the populations. The resulting probability graphs allowed to separate three geochemical populations: population I showing a mean of 21.1 g m−2 d−1 and represented 24.3% of the total data; population II, showing a mean of 98.2 g m−2 d−1 and represented 29.63% of the total data, and population III, showing a mean of 292.5 g m−2 d−1 and represented 3.3% of the total data. Rest of the cumulative probability corresponds to the mixing between the three identified populations. Population I represents the background values due to CO2 degassing by diffusion through the water-air interface as has been proposed by Mazot and Taran (2009) for El Chichón lake, México, and checked using the thin boundary layer model (Liss and Slater, 1974). Population II represents the CO2 efflux values from a deep source of a magmatic origin and Population III may represent gases resulting from mixing of diffuse and bubbling degassing. The existence of three different geochemical populations indicates that there are at least two different mechanisms of degassing through the lake surface, and supports the hypothesis of a deep contribution at Katanuma lake. 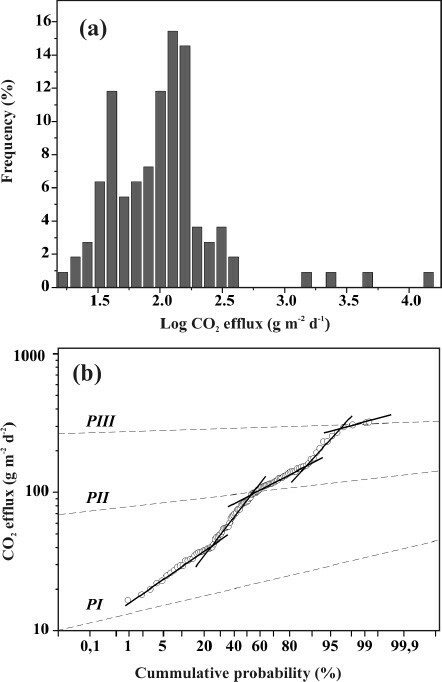 Histogram (a) and probability-plot (b) of the CO2 efflux data measured at Katanuma lake. Open circles indicate the original data. Dashed lines indicate separated geochemical populations. A total of 200 simulations were performed over a grid of 5696 squared cells (5 m × 5 m) following the variogram model to construct a spatial distribution map for CO2 efflux (Fig. 7), water temperature (Fig. 8(a)) and pH (Fig. 8(b)). The experimental variograms were fitted with a spherical model with the following parameters: nugget of 0.15 and range of 45 m. An average map was then constructed using the average of the different values simulated at each cell. Since quantification of the uncertainty of the total CO2 is an important task, the mean and standard deviation of the 200 simulated values of total CO2 output were assumed to be characteristics of the CO2 efflux and its uncertainty (Cardellini et al., 2003). Figure 7 shows the CO2 efflux distribution map at Katanuma lake based on the mean simulated total CO2 output values. Surface CO2 efflux map of Katanuma lake as a mean of 200 sequential Gaussian simulations. Bathimetric lines (white lines) are also showninthe figure. X and Y axis are in UTM coordinates. (a) Surface water temperature map and (b) surface water pH map of Katanuma lake, both as a mean of 200 sequential Gaussian simulations for explanation). Bathimetric lines (white lines) are also shown in both figures. X and Y axis are in UTM coordinates. Inspection of the CO2 efflux contour map for Katanuma lake (Fig. 7) shows the existence of three anomalous areas of CO2 degassing through the lake surface without a clear emission trend. High CO2 efflux values were always measured nearby visible gas bubbling emanations and located above the deepest areas of the lake, south and northeast basins of the lake, where hot springs are thought to issue. Figure 8(a) shows water temperature contour map for Katanuma lake together with bathymetric contour lines. Even when there is a homogeneous distribution of temperature at the surface of the lake, some slight increase in temperature was observed at the southern most part of the lake. To estimate the total output of diffuse CO2 released from Katanuma lake, we considered the contribution of each cell obtained after SGS and the average of the 200 simulations to estimate the total output with one standard deviation as the uncertainty. The result was 17±0.6td−1 for diffuse CO2. This value is smaller than the emission rates reported for other volcanic lakes (Pérez et al., 2011). However, in order to compare individual CO2 emission of various volcanic lakes, it is important to consider the lake-type and the area. Figure 8(b) shows water pH contour map for Katanuma lake together with bathymetric contour lines. Most of the surface water showed an almost homogeneous acidic pH (∼2.0) distribution. Katanuma, as an acid lake with an area of 1.26 × 105 m2, would have a normalized CO2 emission of 136 t d−1 km−2, a value close to that from other acid volcanic lakes in the world (Pérez et al., 2011). As reported by Takagi et al. (2005), Katanuma lake circulates from late August to December and stratifies from April to late August. Our survey was carried out at the beginning of the monomictic circulation period (August), which significantly reduces accumulation of CO2 in the deepest part of the lake, and maximizes CO2 emission to the atmosphere. During the overturn period, when the present study was carried out, the emission of CO2 is mainly diffusive, advective and convective, showing the maximum CO2 emission in the year. In order to evaluate the CO2 emission from the bubbling spots, we measured the CO2 flux from 10 spots using the same method. We visually counted approximately 100 bubbling spots and assumed an average CO2 emission rate per bubbling spot of 14 kg d−1. Under the above assumption we estimated a total CO2 emission of 1.4 t d−1 from bubbling degassing. As a whole, adding diffuse and visible bubbling degassing, the total CO2 emission from Katanuma is estimated to be 18.4 td−1. Since water from Katanuma lake is acidic (pH ∼2.0), almost all CO2 is present as dissolved CO2 and will diffuse out of the water, allowing volcanic gas fluxes to be channeled through the acid lake. Therefore, 18.4 td−1 of CO2 can be considered as a deep-seated CO2 emission from Katanuma lake, because relatively high CO2 efflux values were measured during this survey including data from all geochemical populations (16.6–322gm−2 d−1). Chemical and isotopic compositions of bubbling gases were analyzed to constrain the origin of the gases emitted through the water of Katanuma lake. Bubbling gases are clearly CO2-dominated (72.6%V) and contain He (10 ppmV), O2 (4.6%V), N2 (22.5%V), Ar (0.2%V) and CH4 (477 ppmV) in minor amounts. N2/Ar ratio at the Katanuma bubbling gases (112.5) is notably higher than the air ratio (83.6) and air-saturated water (ASW; ∼36.8), indicating an additional non-atmospheric N2 source, typical for arc volcanoes. Measured δ13C-CO2 value for Katanuma bubbling gases (−1.59±0.03‰) is heavier than MORB values of −6.5±2.5‰ (Pineau and Javoy, 1983; Taylor, 1986). The measured value indicates a typical isotopic composition for gases from volcanic arcs (e.g. Taylor, 1986; Marty et al., 1989; Sano and Marty, 1995; Sano and Williams, 1996; Pedroni et al.1999; Shaw et al.2003). The 3He/4He ratio was also measured at 3.46±0.06 Ra, where Ra denotes the atmospheric 3He/4He ratio (1.4 × 10−6, Mamyrin et al.1970). The relatively low 4He/20Ne ratio of the sample (3.73) is higher than that of the atmosphere (0.318), but still suggests atmospheric contamination of the sample. The measured 3He/4He ratio is similar to the value of 4.86±0.17 Ra reported by Asamori et al (2010) from the hot spring nearest to Naruko volcano. The value supports the existence of a hydrothermal system which supplies materials from underlying magma. In general, He in natural gases is composed of three components: atmospheric He, crustal or radiogenic He, and primordial He derived from the upper mantle. In order to estimate the mixing ratio of these components using the observed 3He/4He and 20Ne/4He ratios, we followed the methodology proposed by Sano et al. (1982). The calculated contribution for each component was 35.9%, 55.6% and 8.5% for MOR-type (upper mantle), crustal and air, respectively. The large contribution of the upper mantle He in Katanuma gas sample confirms active magmatic activity beneath the Naruko-Katanuma volcanic system. Bubbling springs with lower gas/water ratios generally show higher 3He/4He ratios and consequently lower CO2/3He ratios (Rouwet et al, 2009). As He is less soluble in water than CO2 (Stephen and Stephen, 1963), and 3He is lighter than 4He, gases liberated from a weakly bubbling spring tend to be enriched in 3He during near-surface degassing processes and vapour separation in an aqueous hydrothermal system. This has been observed in the other volcanic areas, e.g. Tacaná volcano in Guatelama (Rouwet et al, 2009). In order to detail deep magmatic and near-surface physical degassing processes at Katanuma lake, we have calculated the CO2/3 He ratio of the bubbling gas. The CO2/3He ratio is 1.54 × 1010, a value that fits well with the average value established for worldwide arcs (1.5 ± 1.1 × 1010; Sano and Williams, 1996). The three-component mixing model reported by Sano and Marty (1995) to calculate relative proportions of carbon sources contributing to arc magmas; MORB (M), marine limestones (L) and organic sediments (S) was used to estimate the fraction of each C source for Katanuma gas sample. L source contributes 53.6%, S source 3.6% and the M source 42.8%. These values are in the same order than the reported by Sano and Marty (1995) for bubbling gas and fumarolic gas samples from Japanese volcanic areas, with limestones as the main C component followed by the MORB-type C. Organic sedimentary C fraction is relatively low (3.6%), suggesting that the fumarolic feeding system beneath Katanuma lake corresponds to high temperature fumaroles. CO2 efflux measurements were performed at the surface of Katanuma, a volcanic lake in Japan, by using the floating accumulation chamber method. This study allowed an estimation of 17±0.6td−1 as total diffuse CO2 emission and ∼1.4 t d−1 as CO2 emitted from bubbling spots. Chemical and isotopic analyses of bubbling gas samples from the Katanuma lake indicate a strong magmatic contribution to the gases with CO2 as the dominating gas species. To perform regular diffuse CO2 emission surveys at Katanuma lake would be important for detecting possible changes in the activity of the volcano. This research was supported by the Japan Society for the Promotion of Science (Ref. : L10522) and the Cabildo Insular de Tenerife (Canary Islands, Spain). We are grateful to Katanuma boat rental office for their help during the field work and logistic support. The authors also want to thank M. Kusakabe and an anonymous reviewer for the constructive reviews of this manuscript as well as T. Hernan for the English reviewing. 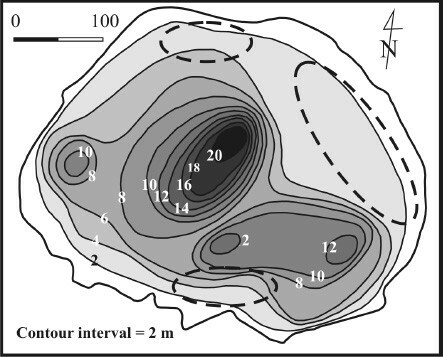 Asamori, K., K. Umeda, Y. Ogawa, and T. Oikawa, Electrical resistivity structure and helium isotopes around Naruko volcano, northeastern Japan and its implication for the distribution of crustal magma, Int. J. 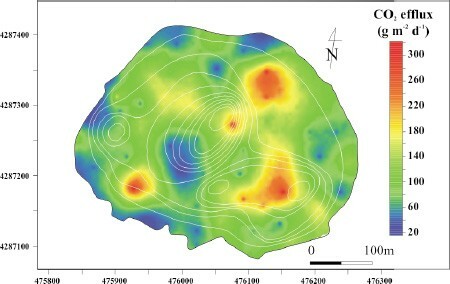 Geophys., 2010, Article ID 738139, pp. 7, doi:10.1155/2010/738139, 2010. Ban, M., K. Takahashi, T. Horie, and N. Toya, Petrogenesis of mafic inclusions in rhyolitic lavas from Narugo volcano, Northeastern Japan, J. Petrol., 1–21, doi:10.1093/petrology/egi025, 2005.